This preview has been provided by the St. Stephen's Concert Series. On Sunday, April 28, at 4:00 pm, the internationally acclaimed Rose Ensemble will present a concert at St. Stephen's Episcopal Church in Durham. 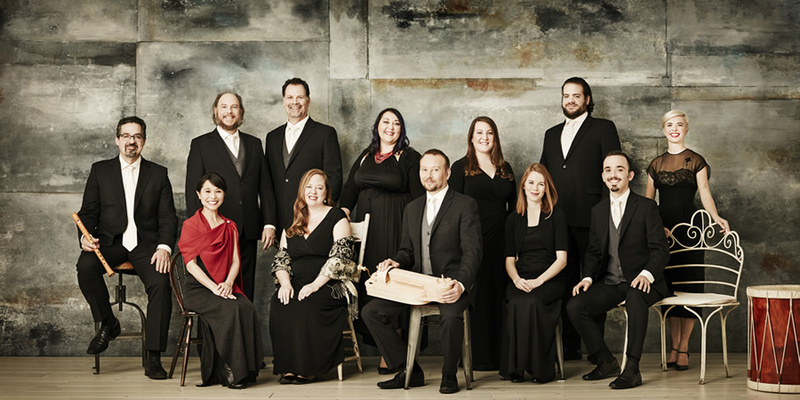 Since its founding in 1996 by Artistic Director Jordan Sramek, the Minneapolis based group has thrilled audiences in the United States and Europe with wide ranging, often rarely heard, repertoire spanning 1,000 years and over 25 languages. Heard regularly on American Public Media and European Broadcasting Union, The Rose Ensemble was the recipient of the 2005 Chorus America Margaret Hillis Award for Choral Excellence and in 2012 it was the first prize winner in BOTH the sacred and secular categories at the 2012 Tolosa Choral Contest in Spain. For their concert at St. Stephen's, ten members of The Rose Ensemble, eight singers and two instrumentalists, will present "Welcome the Stranger: The Promise of St. Benedict and St. Scholastica." From the Artistic Director: The year is 1618 and a mythical gathering of Milianese Benedictines is about to take place. Virtuosic compositions by local nuns are intermingled with medieval plainchant and Renaissance motets of the Cassinese monks of Saint Simpiciano. Music is shared and communities are welcomed. Over five centuries of music exploring St. Benedict's Rule of unconditional hospitality is featured. Music by three women composers, Lucrezia Orasina Vizzana (1590-1602), Caterina Assandra (1590-1618), and Chiara Margarita Cozzolani (1692-1678) is highlighted, as well as a new work honoring St. Scholastica by Minnesota composer Abbie Bitines. This is the final concert of the 2018-2019 season of the St. Stephen's Concert Series. As usual, tickets ($25) will be available at the door with free admission for those 18 or under. A half-hour Pre-Concert Discussion will take place at 3:00 pm and a reception will follow the concert. The church is located at 82 Kimberly Drive, Durham 27707.